Some schools are ahead of the game. They are taking advantage of the myriad benefits for making a "vendor of record" commitment to a Team Dealer for all of their athletic apparel and team gear purchases. Many schools have not taken this step, either because they have not made a clear determination of the value exchange or perhaps they think they have to make a commitment to a single brand and this is too restrictive. If you're wrapped up in an All-School program you don't like, consider preparing a RFP following these guidelines so you can maximize the benefits to your school. If you have not entertained an all-school program, prepare a RFP to determine the value you could receive back in the form of incentives, free promotional product, manufacturing credits and fundraising dollars. Regardless of which group you're part of, follow these best practice guidelines to ensure you get the most value back for your institution. Total Spend Assessment: A thoughtful analysis of the entire spend on apparel will guide a Team Dealer or a major apparel brand (e.g. Under Armour, Adidas etc..) to craft the best package for the institution with the maximum incentives. Segment annual spending in the following areas to achieve the maximum benefit: Athletics including on-the-field (uniforms) and off-the-field (training gear, sideline gear, team suits etc...), School store, Booster Club purchasing, Alumni & Development, Facilities and Maintenance all have apparel requirements that make the aggregate spend add up. Hard Goods & Footwear: Include a detailed review of the hard goods (e.g. helmets, sticks, bats, balls etc...) purchased annually. Team Dealers provide these products as well and should be considered as part of the overall package. And, don't forget footwear. Include all items that the Dealer can provide and you'll receive the maximum incentives package in return. Uniform Buying Schedule: Provide a comprehensive schedule for uniform replenishment by sport by season for the Dealer. This will allow them to negotiate more effectively on your behalf. If new uniforms are scheduled for major sports such as Football, Baseball, Hockey and Lacrosse in the first year of the contract cycle, that will provide leverage to the Dealer and they will incentivize accordingly. A four-year schedule is typically appropriate for every Varsity Sport on campus. If you're a higher ed institution, documenting the buying patterns and spending volumes for club and intramural sports should be documented as well. How many teams, how many athletes, how do club sports purchase apparel, will club sports apparel buying be part of the directed spend ARE all questions that should be answered in the RFP. Carve-Outs: Perhaps you've decided that every varsity athlete should have a particular team suit; or the swim team has a direct deal with Speedo; or the soccer coach won't put his or her team in anything other than Adidas. Regardless, a Team Dealer receiving your All-School RFP needs to be aware of these exceptions. If they do not carry a particular brand, they will not be able to fulfill your requirement. It's not a problem, it's about setting expectations and transparency that some of the apparel and/or gear ordering will not be part of the program. Every all-school program has grey edges related to buying restrictions. Make the dealer aware of your carve outs and you'll achieve a perfectly aligned proposal in return. Program Structure: It really boils down to three models. The first is often referred to as Brand Exclusive. The major brands would tell you that you need to commit all of the ordering for apparel to their brand and in return one will receive significant promotional merchandise, free product in other words. Sign on with Nike and they will require that all apparel purchasing during the contract cycle must be Nike. That includes uniforms and training/sideline gear That seems fair, they're providing significant incentives as a quid pro quo for the school's ordering commitment exclusively. Most schools find this restrictive even when exceptions have been Carve-Outs or if a particular brand does not support a particular sport. The second deal format is Brand Agnostic and is often only offered by the more progressive team dealers. In this program structure, all of the incentives come from the dealer, with no support from a major brand. The total incentive package is always less that a brand exclusive program, but the trade-off come in the form of flexibility to provide every team with a custom solution. The third program structure can be referred to as Exclusive - On the Field. This last structure provides a combination of incentives from a major brand, with the flexibility of buying off-brands from the Team Dealer as appropriate. Typically in this arrangement the school will commit to buying all new varsity uniforms from a particular brand (so long as that sport is supported), but all other product requirements such as training and sideline gear can be sourced to other brands as needed. This allows a school to maximize value by outfitting athletes with the best uniforms the brand has to offer, but to be able to utilize value brands for outerwear and training gear to reduce total costs. This type of buying arrangement also applies to institutions switching from brand to brand, for example ending a relationship with Adidias and switching to Under Armour. Because all the varsity teams are in Under Armour and the uniforms won't be switched out all at once, a school should align with a team dealer that can not only support the new brand, but also the legacy brand so "fill-in" uniforms can be handled from a single source. Guaranteed MSRP Discounting and Firm Decoration Costing: Ask for a fixed discount from MSRP and standing pricing for all applicable embellishment styles. This will provide a total cost of ownership analysis for the finished garment. Additionally, 25 or 30 or 35 off MSRP from one brand to the next is not apples to apples. Be mindful of this. Nike's base product MSRP may be higher than Under Armour for example. Even if their discount is more, the cost to the school could still be higher. An analysis of total cost should be a required element in any RFP response. Technology Support: Team ordering made easy is made possible by robust online shopping storefronts with custom merchandising and brand controls. Every team needs training and sideline gear, but the school doesn't pay for all of it. Setting up team-specific buying environments online with custom product for that team/sport makes it easy for teams to get the gear they need & want. And, what's best, players & parents can do the buying eliminating the massive headache of coaches collecting checks. Make sure your dealer has these tools in place. More on the benefits of Team Stores can be found here. Custom Products: Many Team Dealers are a lot more than just resellers that understand what's in Under Armour's catalog. Look behind the curtains. Understand the origins of the company you're qualifying. Ask them about the evolution of their business, who owns the company, what were the company's origins, what the vision is for the future, do they have a vision statement that guides their purpose as a business, do they engage in any philanthropy or socially responsible initiatives etc... There may be more than appears on the surface that can benefit your institution. Additionally, look for traces of expertise that you can lean on if you need to. Many institutions require custom products, perhaps customer styles or colors. If this is the case, attempt to find company with a depth of expertise in garment development, textile innovation and qualified sources of supply for "cut & sew" operations in place that would allow them to custom manufacture whatever you might need. Facility Visit: When it comes to Team Dealers nothing could be more true than the cliche....Seeing is Believing!! All Team Dealers are NOT created equal. A facility visit should absolutely be included as part of every decision process for selecting a reputable Team Dealer to become responsible for the school's campus-wide requirements for athletic apparel. Many dealers are just store-fronts that service the local community; others are national providers with systems in place to ensure accuracy, timely delivery and quality. Some are "mom&pop" operators run as such; others have invested in significant infrastructure such as decorating capacity in-house, warehouse mgmt. software, sophisticated systems for tracking goods in transit, receipts, inventory on-hand and production throughput. A visit is the only way to fully understand which type of company you'll be slecting to partner with. SpiritWear and Fundraising: Spiritwear and Fundraising are a Perfect Match! Budgets are tight and Athletics Departments never usually have enough funding to go around. Also, it's commonplace for the community's desire for Spirit Wear (also often referred to as logowear) to be underserved. These two issues can be resolved with ONE solution. 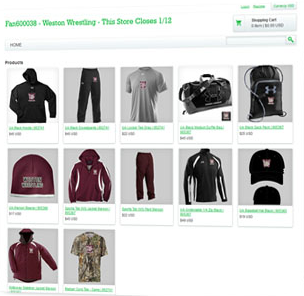 Students, parents, faculty and alumni often do not have an easy place to go online to buy hoodies, sweats, jackets, hats and anything else that can be branded. Or, perhaps the bookstore has an online store, but are all of the athletic marks available? Can the Football parents get gear with the Football marks; can the Lacrosse alumni get gear with that teams athletic mark? Also, the storefront should provide the ability to personalize each garment with a name and #. After all, that's what the players get. When you're making a significant commitment to a Team Dealer or major apparel brand, make certain they provide you with an online store merchandised with brands like Under Armour and Adidas as well as value brands for the more budget conscious shoppers. Make sure that all the inventory risk is on the dealer and hold them to make one unit at a time when the orders come in. This model will be the best support for your community. Lastly, and here's where the fundraising comes in. Have them provide 10% back on all sales to Athletics as a source of fundraising. This could be worth thousands to you over the course of the year. Utilize these tips to assist you in preparing a thorough RFP. Or, if you'd like assistance directly, we're here to help. Please contact Todd Grant, President, SquadLocker ( tgrant@squadlocker.com ).